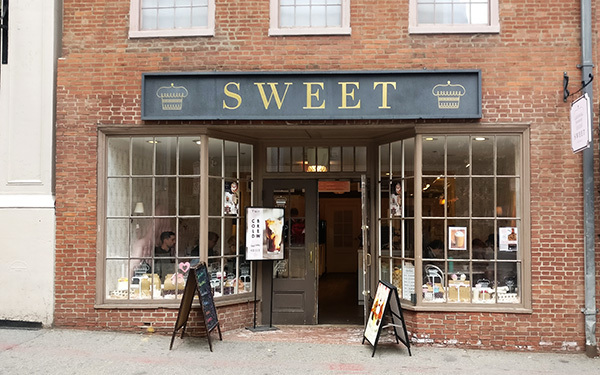 Sweet Bakery, a cupcake confectionery, has locations through the Boston, Massachusetts area. You’ll find them in many locations throughout the city, including next door to the World’s Only Curious George Toy Store, and along the freedom trail at the location of The Older Corner Bookstore. You can’t miss them, but you probably should. The bottom line is Boston is full of incredible bakeries from Mike’s Pastry and Modern Pastry in the North End to Flour Bakery and Cafe, that Sweets Bakery just doesn’t compare. This baby pink covered store feels a bit hipster cliche with unoriginal flavor combinations, lack of flavor, and $100 miniature cakes. The store basically offers two things: cupcakes and coffee. You can order your cupcakes without frosting, or order your frosting without cupcakes. 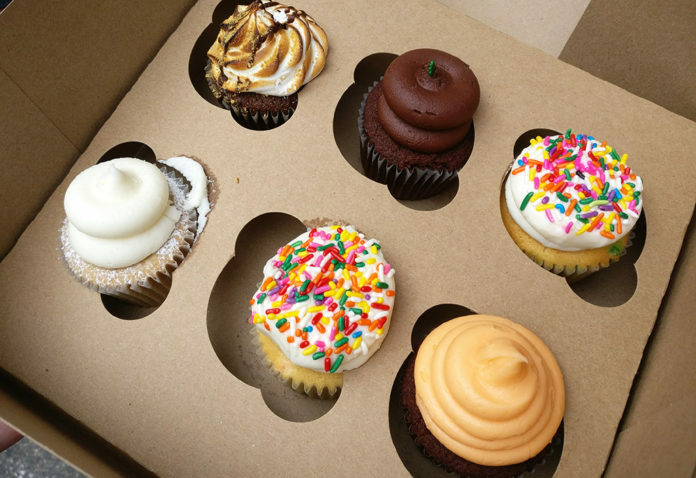 Cupcakes are offered in regular sizes, and mini sizes, in 22-25 rotating flavors. Coffee comes hot or cold, with all the fancy options they do to it. Then they offer cake versions of their cupcakes, in escalating sizes, starting with a cake the size of your fist ringing up at $65. We ordered half a dozen cupcakes for $18.60, a savings of 90¢ off buying them individually. 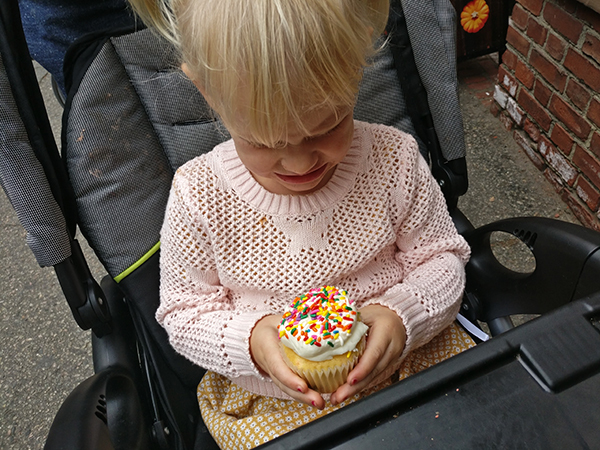 The girls both ordered a Vanilla Cupcake with Rainbow Jimmies. 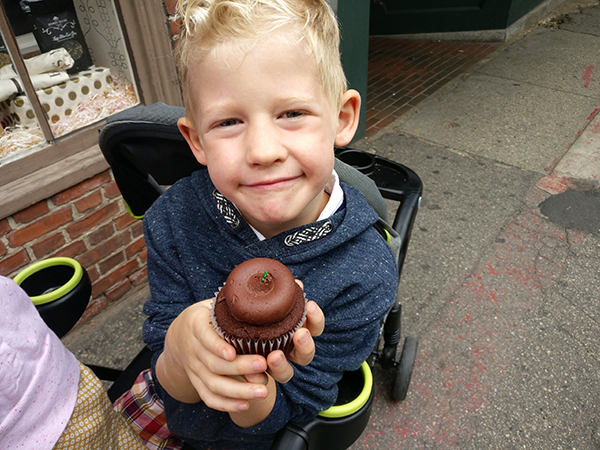 Widmore chose a Dark Chocolate Cupcake because he refuses to acknowledge any other flavors exist in the world. I opted for the S’mores Cupcake, and Gabriel chose a Chocolate Orange Cupcake. To round out the six, we also ordered an Apple Pie Cupcake. When we opened the box, we were immediately bothered by the fact that our cupcakes were ruined. Though they placed our cupcakes in a nice box with six slots to secure the cupcakes from tipping over, the slots were about two times as big as the cupcakes which decapitated the frosting heads from the cake bodies. Trying to pull them out of the slot was even more difficult as the sticky frosting wanted to stay attached to the slick cardboard. Of these six flavors, the best of the bunch was the Smore’s Cupcake even as the graham cracker crust fell to the ground as soon as the wrapper was pulled off and none of it remained. 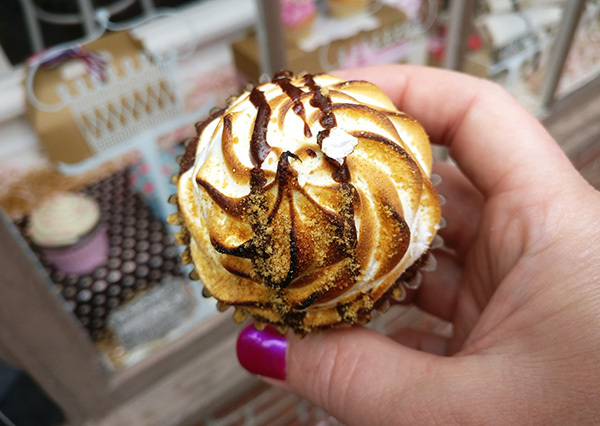 The cupcake tasted infused with a graham cracker flour, and the frosting was burnt marshmallow fluff. Next was the Chocolate Orange, hard to mess up the perfect pairing of two complementary flavors. Chocolate and Vanilla deserve no special explanation, and the Apple Pie cupcake was just bad. You need more than just cinnamon spice and apple chunks to differentiate a cupcake from a muffin. The hard part about making a really good cupcake is retaining the shape and mass of it, while still allowing it to be soft and fluffy. That’s one reason so much frosting is added, but if you ask me, frosting should be mostly ornamental. A perfect cupcake shouldn’t need any frosting at all. ► For Kids: Sweet Bakery has a cute exterior, where the dial on the color wheel is planted firmly on the pink quadrant. 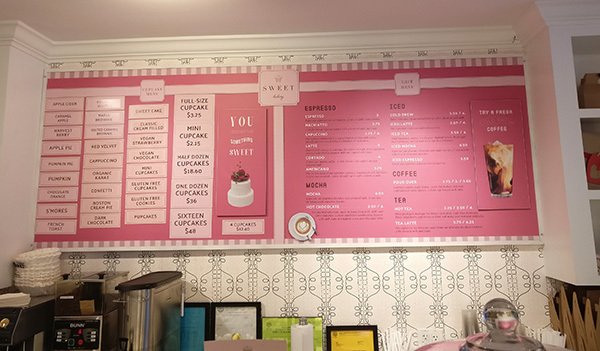 Especially girls, who love the color pink, will love exploring the different flavors of cupcakes offered here. 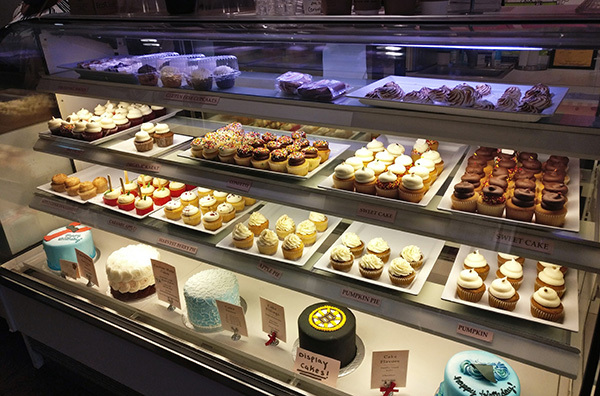 Have you tried Sweet Bakery? Did you try out the cupcakes, the coffee, or both? 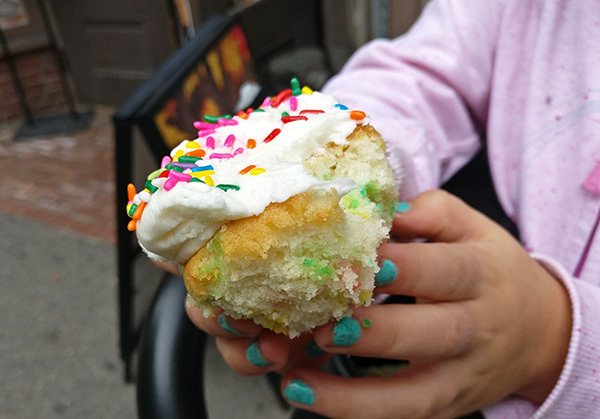 Do you agree the cakes can’t stand alone without using the frosting as a crutch, or do you place them in your Top 10 list when ranking Boston bakeries? 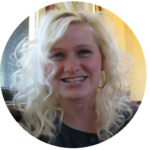 Obviously many of you do, because there are five locations throughout the area. ► Nap-Time Version: This pink paradise isn’t too overpriced for a few cupcakes, and they’ll satisfy a craving, but Sweet Bakery won’t satiate the desire for something that is truly fulfilling. Check out our review of the Cookie Monstah Food Truck, a great alternative to this bakery even though they got the Apple Crisp ice cream all wrong too! East Coasters must make their apple desserts totally different than us West Coasters. Looking for another yummy treat? Check our our Tots Taste Test comparing cannoli’s over at Mike’s Pastry vs. Modern Pastry.